Anthropology in Practice: Why Do We Hurry to Wait? While traveling a few weeks ago, I had ample opportunity to observe the art of waiting. Or rather, the art of not waiting. New Yorkers aren’t known for their patience—something that became painfully obvious when I got frustrated with the service S and I received at a south Florida restaurant. (If it takes more than 10 minutes for a server to come by and get drink orders after the customer has been seated, there is something wrong. We left, by the way, as even the normally unflappable S was perturbed, and were seated and served almost immediately—at the establishment just next door. (1)) While it may be that New Yorkers generally have little tolerance at being made to wait—and really, when you live in a culture of 24/7, the expectations are rather high—perhaps there are certain situations in which we’re all a bit impatient. Let’s consider the airport, for example. 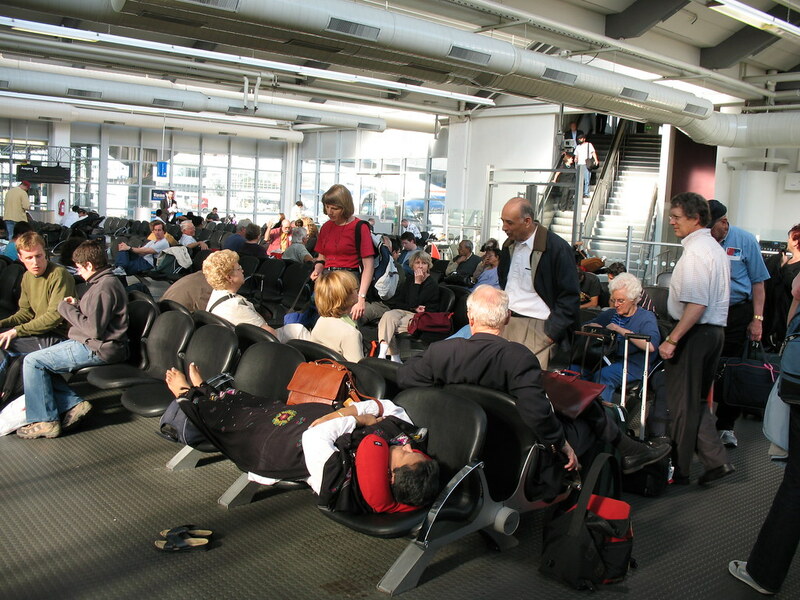 So you’ve made it through security with your carry-ons and your assorted electronic devices, managed to get your shoes and belt back on, and are milling about the boarding area. So are most of the other people waiting to board that flight. They’re waiting in various forms. Some may be reading. Some may be occupied by their assorted electronic devices. Some are chatting animatedly or trying to restrain young children from escaping into the crowd. And some—though this number is small—are simply sitting, seemingly staring off into space, but quite possibly making astute observations about their nearby seatmates. And then the gate attendant arrives, and the mood of the crowd shifts. People start to pack up their modes of entertainment, and start to look expectant. It’s almost time for the event to begin! Soon we will be able to board and take our pre-assigned seats! The boarding process is no secret: parents with young children or those needing assistance are allowed to board first, and then the plane is filled with passengers seated in the rear leading the way. So then why do people anxiously begin to wait to board in front of the gate attendant’s kiosk before the attendant has even announced boarding will begin? All it takes is one person too. One single person who has packed up his gadgets or book, armed with his carry-on, standing expectantly in front of the kiosk will attract others—and as the crowd grows, so does the tension. People begin to glance at phones and watches, they sway back and forth, they sometimes glare at the attendant. I guess no one wants to be left behind. But we all have assigned seats! So why the rush to wait? Waiting is the period we endure until the expected happens. We wait for all sorts of things: the bus, dinner, colleagues who are late for a meeting, the rain to stop, etc. Waiting is built into our social lives. And our waiting behavior is influenced by a fair number of variables. There isn’t a prescribed method for waiting, and yet waiting in certain contexts tends toward a similar pattern of group impatience leading to aggressive strategies that are meant to better position the waiting individual for the event. It may be that people are responding to a need to defend their territory. Territories are defined as areas that are controlled through established boundaries that are defended as necessary (2). There are private and public territories. Homes are private territories that are largely controlled by residents with little to no challenge for ownership from outside parties. However public territories, such as waiting rooms and phone booths, are temporary territories where “ownership” or residence may be challenged simply by the presence of others. Researchers Ruback, Pape, and Doriot report that traditionally people appear to leave an area more quickly when the space around them has been “invaded.” For example, people tend to cross the street faster when grouped with strangers (perhaps this explains New Yorkers’ tendency for speed walking? ), and researchers have found that library patrons will change seats or leave if strangers sit at the same table (3). However, it makes sense that individuals will defend their position in a public space if the benefits outweigh the costs. In a crowded library, for example, patrons will be less likely to move or leave if there are few other available desks. The fact that callers spend more time at a public telephone when others are around them is consistent with both distraction and territorial explanations. The fact that the effect is produced mainly by the presence of particular others, however, is consistent only with a territorial explanation. The distraction explanation would predict that anyone’s presence would interfere with talking on the phone. Yet the observational studies suggested that persistence was produced only by intruders, people who came to the caller’s area after he or she arrived, and not by the people who were already there or who accompanied the caller. Further, the experimental study showed that persistence was caused not only by the second intruder, the one waiting to use the telephone, but not by the first intruder, who used the adjacent telephone (5). There are two ideas at work here. First, the notion that people will want to hang on to coveted resources longer if those resources are not readily available (e.g., a desk in a crowded library, or a working public phone in a phone bank). And second, that the presence of others interrupts the individual’s experience of the event, causing them to take longer to complete the process. In a world inundated by mobile technologies, this example may seem outdated at first glance, but in fact, it helps us understand part of what may be happening as flight passengers—as well as others—hurry up to wait. Though seats are paid for in advance, air travel passengers are preparing to navigate a public territory that they will have to share for a given period of time. And while everyone will definitely have a seat, there may be psychological benefits to being able to settle yourself into your seat—and claim a convenient space in the overhead bin if necessary—before your seatmates arrive. There is no shortage of the resource (seats), but there is no overabundance either, and passengers may be preparing to establish the boundaries that will define their space for the duration of the flight. The very act of seeing others prepare in this case, will compel others to act similarly. Think of it as walking into a crowded, self-service eatery where tables are available, but fill quickly. It isn’t uncommon (in New York at least) for individuals to lay claim to space by leaving an article of clothing or other loss-friendly item to hold their place for them. How does this translate into the expression of frustration and other “aggressive” type waiting behaviors? If people truly attempt to remove themselves from public territories when they feel that their space has been invaded, then we have to understand that what is created in the “hurrying to wait” model is a space of tension. People are purposely positioning themselves to have their space invaded as well as to be invaders. And both positions create a sense of tension—particularly in a space where social norms from different groups are forced to mix. Members of independent cultures strive to maintain a sense of autonomy and emphasize the value of personal values, attitudes, and convictions, whereas the principal goals fo members of interdependence cultures pertain to fitting in or harmonizing with other people (6). Independent individuals have greater personal distance requirements than individuals who are interdependent. The culture of the US as a whole (there may be slight regional tendencies) is independent, but the act of traveling itself and having an assigned seat may also impart independent proclivities in individuals who are from areas with interdependent cultures. Independent and interdependent personalities are not wholly culturally constructed—rather, they are somewhat contextually dependent. For example, research participants who were exposed to their own first name (an element meant to trigger independent identification) were likely to sit farther away from occupied chairs than individuals who were not primed in this way (7). Having a seat may trigger an independent self identification, which in itself has certain expectations that runs counter to the experience of waiting or preparing to occupy a shared public territory. These factors change the expectations associated with the event itself. So now that all these passengers are standing around the attendant kiosk with their carry-ons and boarding passes in hand, perceptions of time change. Though there may not actually be delays, anticipation for the event (boarding the plane) increases. And we can’t overlook the monetary aspect of this: Passengers have paid for the experience of sharing a tight public territory and “if consumers have to pay for waiting, they will be less willing to wait” (8). Hence, the dirty looks directed at the kiosk attendant after about five minutes or so. So what sort of air traveler are you? Do you hurry up to wait at the kiosk? Or do you sit back and watch the complicated social dance that unfurls as people jockey for position to take their assigned seat? NB: I would be remiss not to direct Readers to Jason Goldman’s excellent three-part series on animal territoriality hosted at The Thoughtful Animal, which can be found here, here, and here. 1. Longtime readers will recall that I have had previous issues with the use of and relationship with time in south Florida. 2. Ruback, Pape, Doriot (1989): 232. 6. Holland et. al. (2004): 237. 8. Antonides, Verhoef, and van Aalst (2002): 201. I believe one of the major issues with waiting, especially in the examples given, is that our queueing systems are not Evolutionarily Stable Strategies. These systems work fine if everyone follows the rules, but there are always people who think those rules should not apply to them; since the queueing systems are not ESS, rule-breaking often provides benefits. This is particularly obvious in traffic laws, in which the person who stays in a lane which is ending until the last second ends up well ahead of the people who conscientiously merged earlier. 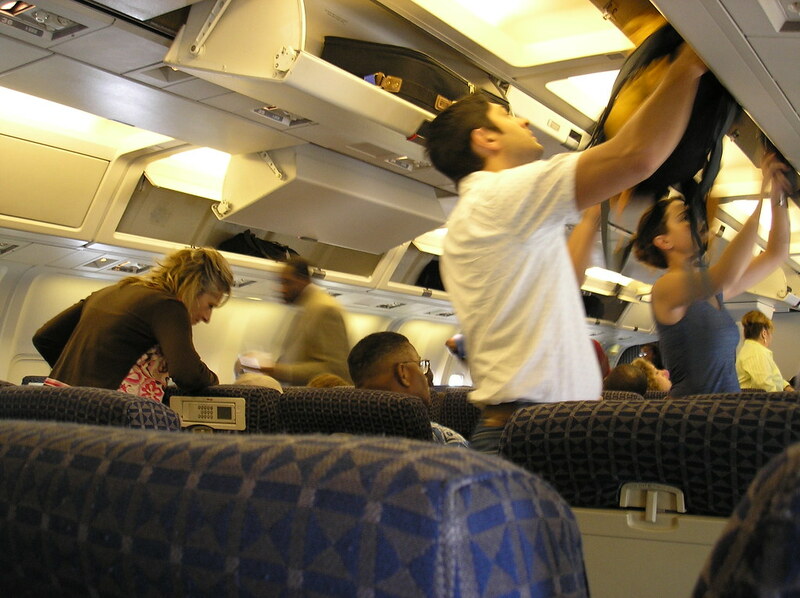 In airlines, while it's generally not possible to board before your boarding group is called, being the first in your boarding group onto the plane does confer other advantages - access to the overhead bins, easier entry to one's seat, and possibly a chance to acquire a pillow or blanket. This seems to hold true in general - if everyone were polite, generous, and considerate, then the system would work well and there'd be no need for people to jockey for position. However, there are always a few people who are cheerfully willing to ignore rules for their personal benefit, and the fear of these actually incites similar behavior in others. @Hasufin: Our queueing systems aren't stable at all - not to mention their diversity - different cultures wait differently and its never more apparent than at an airport (or world-class museum) that these come into conflict. @Hasufin, I recall you saying you lived in a (Southeast) Asian country for awhile, and the traffic patterns resulted in pedestrians developing Frogger-type techniques to cross. Does that sound familiar? If not, then I apologize. I was thinking of that as I read @noellejt's comment—the degree to which "queueing"—of course the British don't do anything as bland as "wait" ;) —comment. However, even in perceived "ordered" societies, I don't think we can overlook the herd effect, and if it seems that one person is waiting for a reward of sorts, then others are going to join in. I've seen people join lines in NYC without knowing what they were for as well. On one such line in Times Square, a waiter told a passerby "It must be good if all these people are waiting" after being questioned about the purpose of lining up. Is that when (in Bangkok or Chiang Mai), I waited for a monk to show up, and then followed him across the street, staying as close as possible? @Krystal - it was only for a month in Manila. Long enough to learn a little, but hardly "living there". I can't say I gained any insight into waiting in line as I got a combination of VIP treatment and "big scary foreigner" treatment. @noellejt - street crossing in Manila was a "special" treat. Basically people would step out in front of moving vehicles, so long as the vehicle had enough time to stop, and would proceed to do this, lane by lane, until making it across the street. While crosswalks did exist, nobody particularly cared about them, neither pedestrians nor drivers. nowadays you have to pay to check baggage, so less people do. and if there's no room left in the overhead bins once you board, you have to gatecheck your bag. Anon - Understood. But people still have to board in sections, so that doesn't quite explain why the woman sitting in seat 3A, who will not get called to board until everyone seated in rows 11 and higher have boarded and claimed bin space, insists on standing up with the crowd that's accumulating in front of the kiosk before boarding has even been announced. And there's no counter to this strategy. There's nothing in place to make it disadvantageous to get up early, except for the added frustration of waiting in line longer. It hardly seems rational since many, if not most, people respond with frustration that they have to wait until it's actually their turn despite already standing in line. But human behavior is hardly a completely rational experience. I took my seat behind a man with an ice-cream cone (he had set his territory boundaries in the independent mode with his seats (2)reclined and his bags occupying the aisle seat) and I readjust the seat in front of me so I will have adequate room for my knees. This man gave me the glare you described of people waiting for an attendant, though the symbolic meaning of this aggressive gesture was different in my episode. He glared because I was "the invader" though, as I observed during the next month of observation, I was within my commuting rights to re-incline the man's chair as this independent space-shaping violated the interdependent folkway on this bus. I wonder if I am alone in observing altruistic behaviour during periods of *movement*? When people transitioned from the LRT to the bus/train station I could expect the person behind me to hold open the door for the person behind her if I had held the door open for her (and provided the person wasn't rushing around). I've always wondered if another typical behavior in airport is related to this one, maybe you could enlighten me. To me, airports are one of the places where human gregariousness is at its peek and where "individual good is playing against common good" blatantly. A lot of rules and processes have been pu in place to limit that (queues, constraints etc...) and two of the last "free" places are the boarding gates (as you described) and the lugage belt once arrived. My question is about this last place. What do you think push people to go stand right by the belt where they prevent other people to see properly (and sometimes get hurt when huge lugage are taken brutally off the belt) when everybody could stay 2-3 steps back and just go to take their lugage / check if it's theirs when they see one. I can't help being irritated with the particular behavior because it is prejudicial to others (when trying to get in first is not that much) and can't explain it to myself ! Oh, Pat. Airports are ethnographic gold mines! The luggage belt is an interesting area for consideration, and my suspicion is that similar practices are at play here, with the added element of exerting a claim over one's possessions. We are looking at a shared space where our possessions are out of our hands. In this case, the luggage represents an actual manifestation of the sense of "territory" that I discuss in the post above. I think what you're describing may be an actual attempt to defend one's territory. 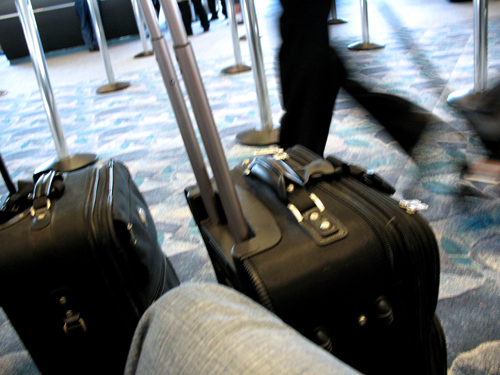 Remember that people may be dealing with all sorts of anxieties—e.g., Will my luggage appear? What if I take the wrong one? What if I miss my bag? What if someone else claims my bag? The key operative there is the word "my" which signals a definition of space. I won't write too much more on this (or else it will turn into a post in its own right), but I invite others to share their thoughts. Thanks for your answer Krystal. It indeed seems that the notion of space/property/territory is at play in this case, with maybe people being afraid they don t get their luggage or get stolen. Keep up the excellent articles !